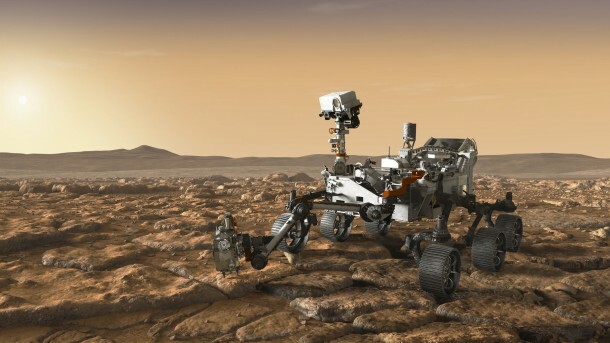 In just a few years, NASA’s next Mars rover mission will be flying to the Red Planet. 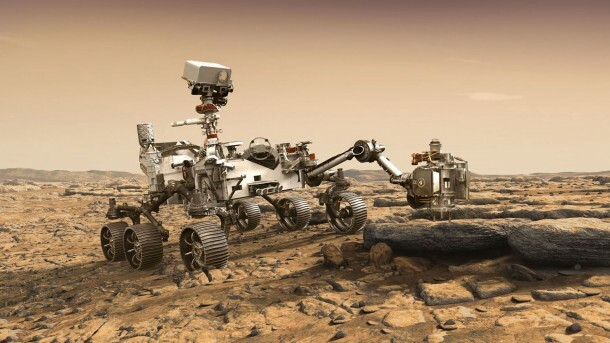 At a glance, it looks a lot like its predecessor, the Curiosity Mars rover. But there’s no doubt it’s a souped-up science machine: It has seven new instruments, redesigned wheels and more autonomy. A drill will capture rock cores, while a caching system with a miniature robotic arm will seal up these samples. Then, they’ll be deposited on the Martian surface for possible pickup by a future mission. This new hardware is being developed at NASA’s Jet Propulsion Laboratory, Pasadena, California, which manages the mission for the agency. It includes the Mars 2020 mission’s cruise stage, which will fly the rover through space, and the descent stage, a rocket-powered “sky crane” that will lower it to the planet’s surface. Both of these stages have recently moved into JPL’s Spacecraft Assembly Facility. Despite its similarities to Mars Science Laboratory, the new mission has very different goals. Mars 2020’s instruments will seek signs of ancient life by studying terrain that is now inhospitable, but once held flowing rivers and lakes, more than 3.5 billion years ago. To achieve these new goals, the rover has a suite of cutting-edge science instruments. It will seek out biosignatures on a microbial scale: An X-ray spectrometer will target spots as small as a grain of table salt, while an ultraviolet laser will detect the “glow” from excited rings of carbon atoms. A ground-penetrating radar will be the first instrument to look under the surface of Mars, mapping layers of rock, water and ice up to 30 feet (10 meters) deep, depending on the material. A related technology called the ranger trigger will use location and velocity to determine when to fire the spacecraft’s parachute. That change will narrow the landing ellipse by more than 50 percent.